DONATE money directly to our dogs in need! 100% of your donation goes to helping a dog. Whether it’s vet care, grooming, toys, food, transportation, etc. BBCR is run 100% by volunteers so you can feel good knowing that a person isn’t benefiting from your donation. We are a 501(c)3 charitable organization, so your donations are tax deductible! We are looking for volunteers to help with a variety of tasks. Find out all the ways that you can join our organization and help dogs in need! Now you can support BBCR while you shop! 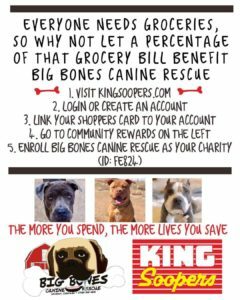 All you have to do is register your King Soopers Card/Alternate ID to support Big Bones Canine Rescue using the instructions below. It’s a one time process and free to you. When you make a purchase at any King Soopers, they will donate a portion of the purchase price to BBCR. It’s that simple! 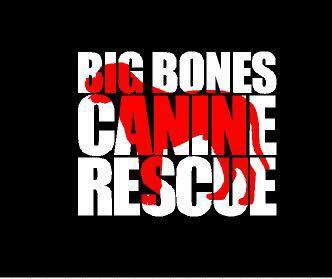 Shop on Amazon Smile and select Big Bones Canine Rescue as your nonprofit. Amazon will donate a percentage of your purchase prices directly to us as long you purchase through Amazon Smile. You can even download an extension on Chrome or Firefox that will automatically redirect your amazon.com visits to smile.amazon.com. We always need items at our facility (the ranch) to help care for our dogs. You can find these on our Amazon Wish List. Make a donation of $11 (includes shipping) through this link and receive a decal for your vehicle.​ Decals measure 6″ x 8″. Sign up to receive our newsletter! It’s a fun way to stay connected to BBCR!